The First Science Fiction Serial Film Was? The Original "Snake Oil" Was Effective At Treating? Flash Gordon debuted in comic strip form in 1934 and quickly gained widespread popularity alongside the popular sci-fi strip it was directly competing with: Buck Rogers. While it may not have beaten Buck Rogers to the printing press, it did beat the popular sci-fi comic strip to a pretty big milestone. In 1936, only two years after the comic was launched, Flash Gordon became the first serialized sci-fi film franchise. 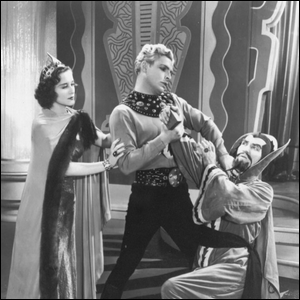 The film centers on the adventures of Flash Gordon and his first visit to the fictional planet Mongo to fight the evil emperor Ming the Merciless—seen here in a still frame from the film. By today’s standards, the film was quite long, weighing in at 4 hours and 5 minutes in total length, but that length was divided into 13 chapters averaging around 19 minutes each. Today, such a short film would be shown as a lead in for a longer film (if it were shown at all), but at the time, the stories were compelling enough that they were shown on their own in top-tier theaters across the United States where they drew large audiences. Fans of the serial would pop in to catch up on the films much in the same way we keep up with our favorite TV series today, taking in a bit of the story at a time.